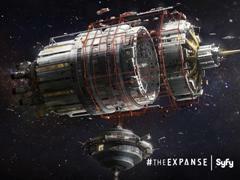 We left off last week with Sophia Maguire (Laura Innes) telling her people their scientist Herbert Mills was getting close to finding the weapon they needed to cull the population of this planet to prepare for their rescue of 2.5 Billion of their people from their sun about to go into supernova. With President Martinez (Blair Underwood) taking a much firmer stance against Vice-President Raymond Jarvis (Bill Smitrovich) and the Aliens. Senator Catherine Lewis (Virginia Madsen) assembled a file on the First Lady; Christina Martinez (Lisa Videl), finding names of people that did not exist and dates that did not match up to her known history. Christina was still not agreeable to take the DNA tests and after much probing by President Martinez, she admitted that her Dominican parents illegally entered the USA as Cuban refugees. She had lied about her history because she feared that her parents and she, herself, would be deported. Not to mention the trouble President himself could face. Leila Buchanan (Sarah Roemer), back in the aliens community, used a ruse of cutting her hand in order to get the bodyguard to take her out of the house to a medic within the community. While in the house where the medical center had been set up, Leila saw Simon Lee (Ian Anthony Dale) restrained in one of the rooms as she, herself was taken in for treatment of her cut hand. She later got to see him. 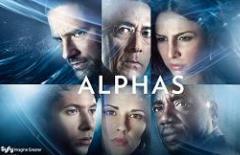 Simon quickly told Leila what Sophia had planned for this planet and bringing her people here. He mentioned a woman’s name, Irena Bogdanov and a search for a weapon in Murmansk, Russia. This weapon was the key to winnow the current population of this world to make room for their own people. Sean Walker (Jason Ritter) saved Vicky Roberts (Tayler Cole) from the fire at the Chateau De Perrault in Moretz, France. 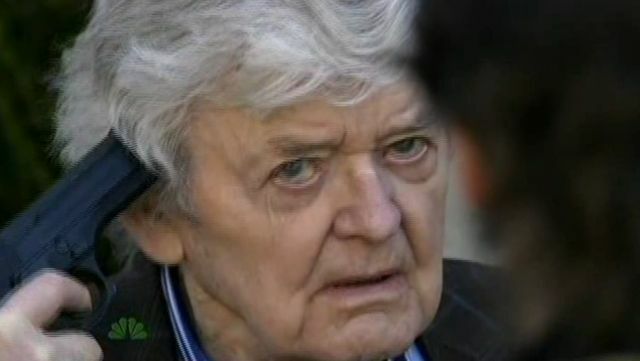 Upon reviving her from the smoke inhalation, Dr. James Dempsey (Hal Holbrook) made his presence known and told Sean it was time they had a little talk. Leila called Sean -who was still in France- to try to warn him of the impending fate of the planet. She had stolen a cell phone from the bodyguard she had invited in for a drink and wound up fighting him, escaping with the phone. During her call, her father Michael Buchanan (Scott Patterson) grabbed her and stopped the call. Sophia was getting Vice-President Jarvis to work with her to eliminate President Martinez. At first Jarvis was hesitant, but after trying to work with Blake Sterling (Zeljko Ivanek) and being given a cold reception, Jarvis knew he no longer had any friends in the Executive Branch. 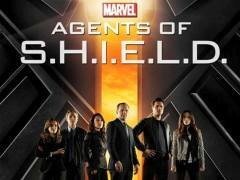 Sophia planned to ‘Cut off the head”… Kill the president and Jarvis was being persuaded to help her. 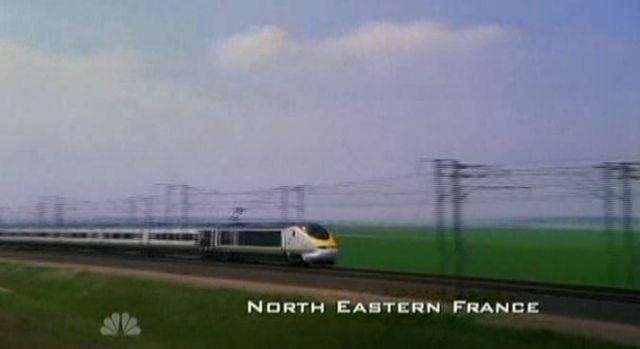 In this case ‘strain’ the title, could mean a strain of a disease. 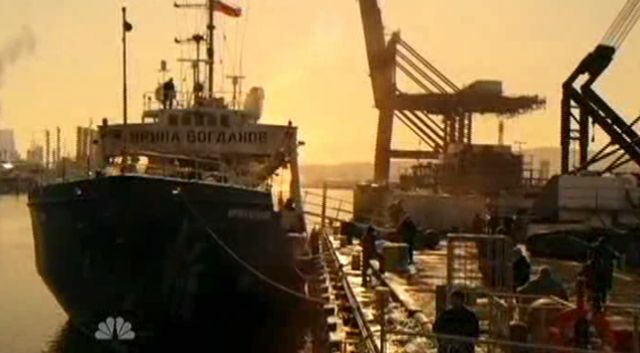 We open in Murmansk, Russia and what appears to be a coffin being placed into a large ship. Down in the hold, the box is opened and the body -frozen stiff- is examined. The Medical Examiner is wearing a full-protection suit. We can hear the chilling ‘crunch’ as the corpse’s arm is lowered by the M.E. as he gets ready to do the autopsy. The corpse is remarkably preserved from having been in the frozen ground for over ninety years. Like many soldiers of that era, one could tell he was most likely quite young when he died and frozen in the ground. 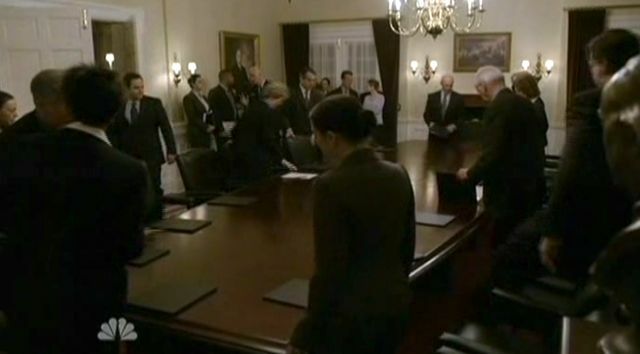 Then the scene goes to the War Room as the President and his cabinet enter into for the morning meeting. We watch close ups of the President preparing the coffee brought to him and he sips it as he speaks to the others about the non-terrestrials. Then the talk goes to a bill that looked as though it would pass, but did not because of unemployment figures which came out at that time. President Martinez instructed to meet with a senator and suddenly, his speech becomes impaired as if he is having a TIA (Transient Ischemic Attack). He is trying to say ‘Let’s take five and…” but the words were mixed up. 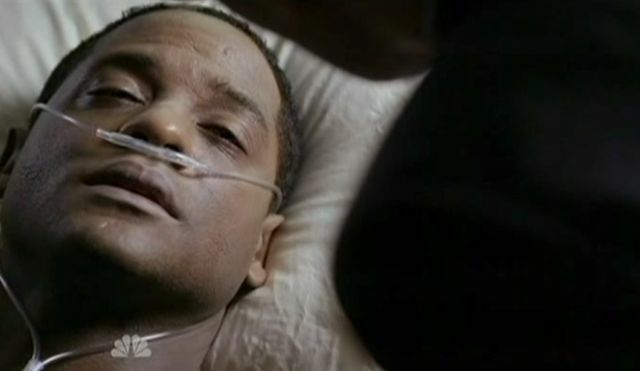 My own father had had three of these TIA’s and I must say Blair Underwood did a fine job of emulating this symptom. His sppech becomes worse as he stands up, disoriented, gripping his head and we can sense he is in pain. He then collapses to the floor. 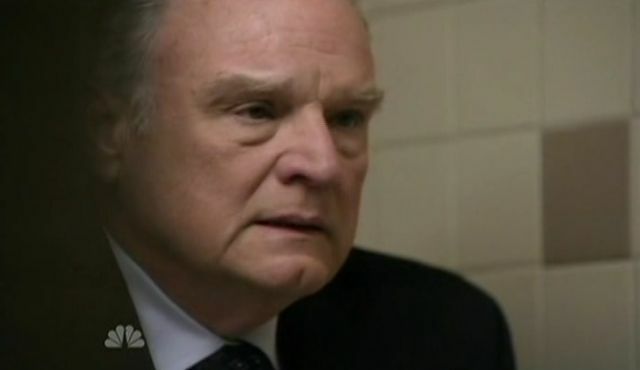 Just before he falls, The President’s eyes lock on with Raymond Jarvis’ who does not even blink. Then, we see the President, surrounded by Emergency staff wheeled in through a hospital corridor and a doctor is barking out orders for medicines and getting President Martinez’s vitals. The flurry of activity is realistic enough for anyone having a brain bleed or stroke. This is what the formal diagnosis is for President Martinez. a brain bleed or hemorrhagic stroke. The Executive Branch are discussing how to keep this on a low-key. Not to panic, not to look vulnerable. The Doctor tells them President Martinez’s inter-cranial pressure is building and if they cannot get this under control, they will have to attempt surgery. 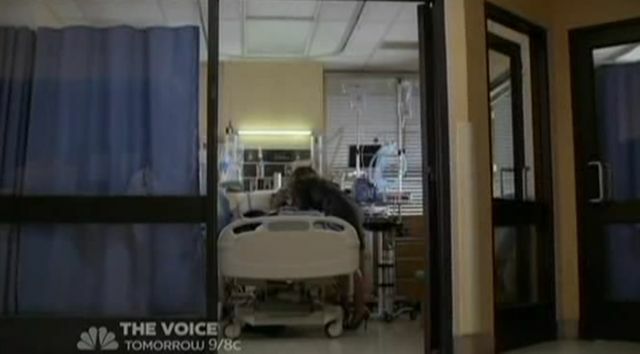 We then see Blake go in to the Intensive Care Unit room where President Martinez is laying. Martinez can still talk, albeit weakly. He tells Blake that Jarvis must not ascend to the Presidency. Martinez tells Blake he knows Jarvis did this. Blake now knows to investigate this matter further. We now see the hospital corridor and Christina entering, distraught, asking to see Elias. Jarvis is feeble in trying to comfort her and tells her “He’s a hero to me” Christina thanks him and goes in to see her husband. Then we see Jarvis going into the rest room, telling the Secret Service agent to ‘Give me a moment’. Jarvis looks into the mirror, in a state of shock and scared. His breathing is somewhat labored and he then runs to a stall and is sick. 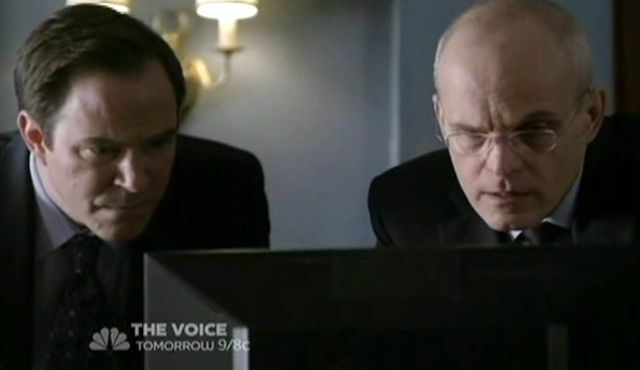 Blake and others of the Secret Service go outside of the hospital and an agent tells him as he sites the twenty-fifth amendment, that action should be taken to put Jarvis in as President. Blake fights this, as he saw the President is still conscious. The agent says “For how long?”. Blake tells the agent that Martinez told him Jarvis was responsible for this, and he is inclined to believe him. “He thinks Jarvis did something to the coffee” Blake says. Amid arguments of “The President’s suffering brain trauma…” Blake succeeds in stalling the swearing in of Jarvis as President for now. He then leaves to try to get hard evidence of Jarvis’ attempt on Martinez’s life. We see Leila outside in the community, talking to Sean, before her father comes up to grab her. This was like a flashback to last week’s episode, but this time it carried on further. 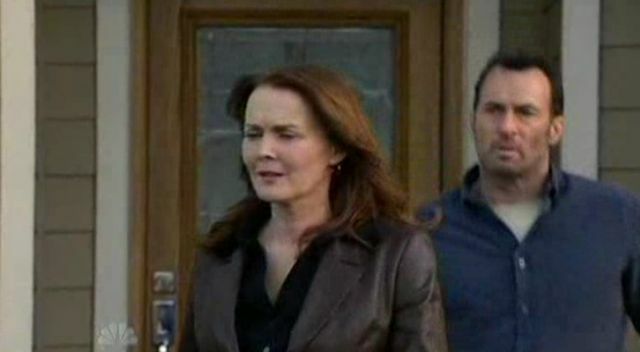 Michael yells at Leila, asking her who she called and what had she told them. “If Sophia finds out, I won’t be able to protect you!” he tells her. “Leila, Who did you call and what did you tell them! ?” he asked again. Leila tells him she called Sean and told him about everything. What the Others were trying to do and the search going on in Siberia. At this point, the Bodyguard, who we now know is called Louis, catches up to them and they all argue it out Louis rightfully tells Michael that Sophia needs to know what happened with this breach of their security by Leila. Michael agrees and the next scene has all three of them walking in the street, presumably to Sophia’s location. Louis says that he felt Leila should never have been brought here. In an instant, Michael kills Louis and tells Leila to grab his stuff, and grab his legs. They are going to dispose of Louis. In the hold of the ship, we see the Medical Examiner dictating into a recorder as he works “The subject is surprisingly intact, even after ninety-three years…” He continues cutting and looking surmising it is most likely due to the permafrost He proceeds to work to expose the organs. He uses a tool to cut into the sternum, and it makes a loud clack as a piece of bone flies off. The scene shifts to the decks of the ship. “The men are worried” said a man “The job has risks that were not fully disclosed” Arron tells him “As long as they stay out of the clean room, your men are perfectly safe.” The man, who I presume to be a Captain remarks “Money will be more convincing than words.” Arron tells him “If you don’t like the job, then quit. You’re not getting more money.” He then tells the captain to get him more smokes, He Crushes the empty packet as he says “I’m out”. Okay, I did not know aliens smoked cigarettes. This guy is either no alien, or they do smoke (!) It would be interesting to see perhaps if they are smoking to ‘shield’ their lungs from what is in the ship and that corpse, perhaps. That would add a “Camp” slant to the story, and I somehow do not see that happening. I will see it as a ruse to get the other man out of the way for a while and cease his questions. Now, the Medical Examiner is removing the ribs from the corpse in the hold. He says as he works “The Lungs, are magnificent. I think we will have very good results. The epithelium are enlarged and the primary bronchi are filled with mucus or some kind of liquid…” We hear his breathing as he continues to work while wearing what appears to be a Hazardous Materials (HazMat) protective suit. No doubt this is a cumbersome, hot outfit to wear, but it is necessary to protect himself from the contaminants in that corpse. He reaches for something and a horn outside blows, seeming to startle him. The M.E. 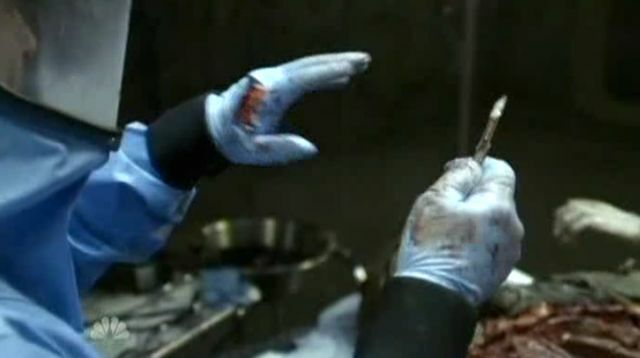 cuts his hand with the scalpel he was using. He doesn’t look right away, but he finally sees the blood on his hands, looks at them and sees he is bleeding. In desperation, he calls out through the locked door to be released from the room, but is told he cannot come out. “Please! I know what I am doing!” he continues to knock at the door and we see the outside handle being turned downward to the “Locked” position. 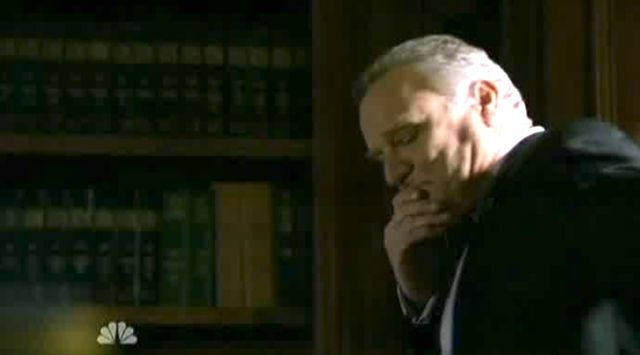 At the White House, Blake enters with the Head of the Secret Service, Agent Peel and tells him they have been tracing all of Jarvis’ movements before the President’s collapse. Jarvis was there in the briefing room early, before the others got there. With further discussion, Blake pulls up the security video of the room and they see Jarvis go to the coffee cart. We see him getting something from his jacket but his back is turned to the camera so we do not actually see what he is doing there. It’s enough to call a lot of red flags up in Blake. Jarvis walks into his office, telling his secretary he is busy and cannot take appointments. As he settles in alone, Sophia calls, wondering why he has not taken power yet. Jarvis says “Because the President isn’t dead yet. If that powder you gave me worked as it was supposed to… Sophia interrupted him saying “The poison is working as it’s supposed to. Be patient. It works slowly. In a few hours, President Martinez will lapse into a coma, and shortly after that he will die and you will be the next president of your country.” Jarvis looks weary and is deeply regretting what he has become, a pawn. 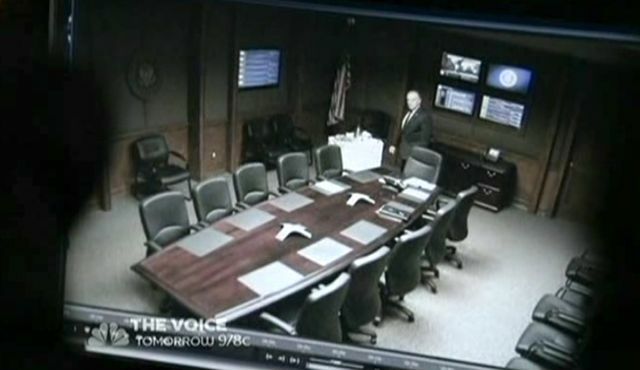 Blake and Peel are watching the video of the meeting as Martinez collapses and they see Jarvis remove the empty packet of sweetener from the table. Peel still says they need more hard evidence. Meanwhile, Jarvis is still on the phone to Sophia. Sophia tells Jarvis there will be no trace of the poison. It is made to metabolize quickly and as long as he took the sweetener packet, there will be no proof. 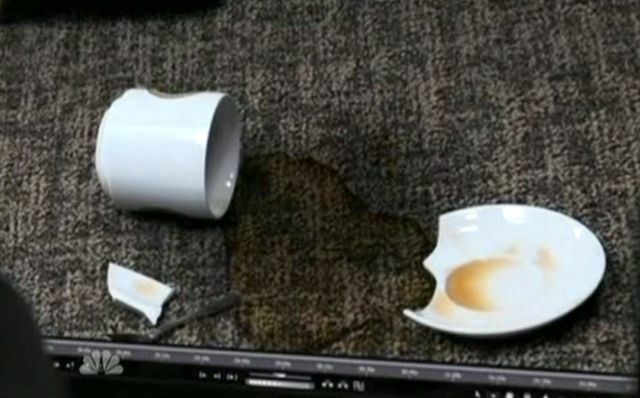 Jarvis has a flashback to the morning’s happenings and says “We may have a problem…” We flash to Blake and Peel looking at the video in Blake’s office and we all see it as well, The spilled coffee. Back to Jarvis as he tells Sophia “When the President collapsed, his coffee spilled. Blake and Peel rush into the Briefing room to find it is already being cleaned by the staff. He turns back to their task “Now clean up the blood, we’re wasting time!” Michael gets Louis into plastic bags and Leila is cleaning the floor as a knock come to the door. It is Sophia. Cue the mad dash to hide bloody cloths and open door to stall Sophia. Michael appears saying he couldn’t sleep and Sophia asks if they can talk outside. Once there, Sophia asks if he has seen Louis. Michael says No, not since last night. Sophia is concerned because Louis is not answering his phone. She asks if Michael can track him down for her. Michael agrees to do so. Back on the docks in Russia, we see the large ship and activity common of such a place. Sean and Vicky are laying low saying that’s the ship. They see the guards and plot how to get onto the ship. Sean asks Vicky why is she here with him. Before now, everything she has done has been for money or family. Vicky asks him “Why do you think I’m here?” Sean replies that he has no idea. “Honestly, I don’t understand you, at all” Vicky says “That’s right, you don’t” As they both jump up and hijack a small fishing boat, knocking out the owner and swiping a smaller lifeboat from it. 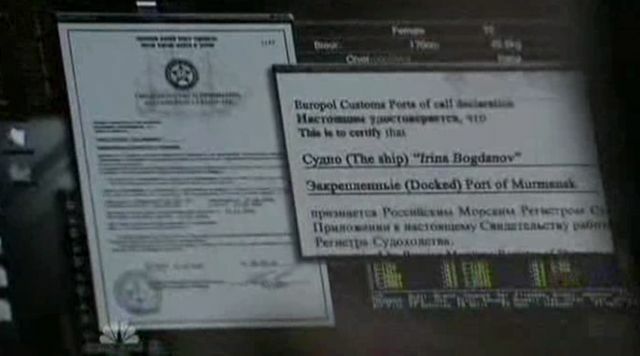 The two then sidle up to the Irena Bogdinov and climb up its’ side to gain entry onto the ship. They find the bridge is deserted and guards are not present on the large vessel. They find the room and as Vicky is about to open the door, Sean tells her not to. There might be something inside. 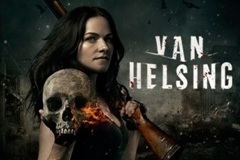 Vicky looks in through the porthole of the door and sees the remains of a man, not the original corpse. “What the Hell happened in there?” she asks. Sean hands her one of the HazMat suits saying “Only one way to find out”. We see them enter the room to a myriad of blood, remains of men and it looks very bad. Eventually they come to the plastic ‘walls’ of the makeshift autopsy room and they see the corpse. Vicky says she doesn’t know from what, but this one is wearing a uniform “He was a soldier..”. His chest had been cut open and she asked why. Sean looked it over and said “To get to his lungs. They’re missing.” This effect was pretty impressive. While some may find this to be ‘gross’, it is still our biology. 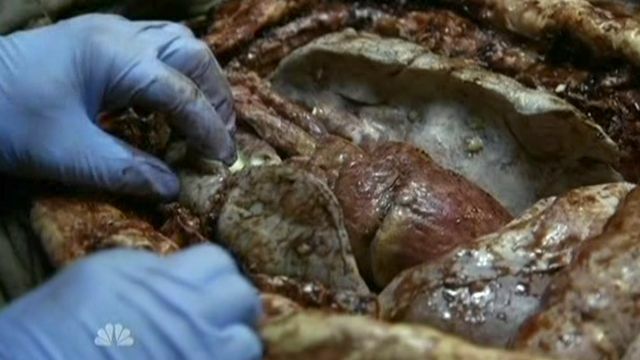 Earlier, during the autopsy, we saw pristine lungs. These were taken, neatly and entirely, but now we ask why? I have an idea or two, but having done well in biology and Anatomy, among other allied health fields, I’m going to let you, the reader theorize. In the USA, the Cabinet members, Jarvis and others are convening to enact the succession protocol which will make Jarvis the new President of the United States. Blake and Peel are in a hallway and Peel asked if they got anything from the briefing room. Blake tells him the fiber samples from the carpet were too contaminated from the cleaning solution. Blake says these proceedings must be stopped. He must have a chance to present evidence. Peel reminds him there really isn’t any useable evidence. “You’ll have to play along. and if you can’t do that, don’t go in… ever”. The secretaries are convened and a majority vote of ‘Ayes’ are taken. Jarvis is now to become President of the United States. Blake returns to his office later, he looks dejected and very sad. He wonders, perhaps if there was something… a little bit of tangible evidence he might have missed! Surely no one could be this good at hiding their nefarious actions! As his head is resting on his hands, he looks, he sees…. 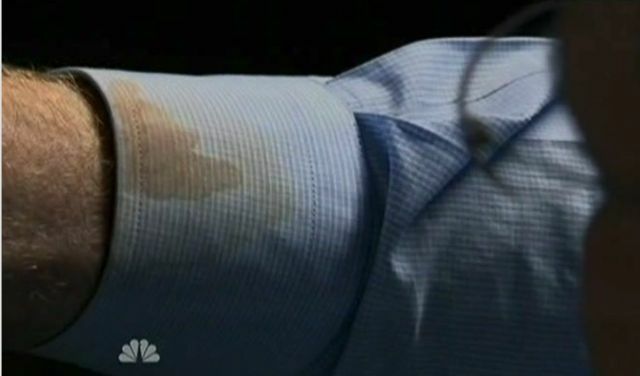 The coffee stain on his own shirt sleeve! He’s had the evidence all along!! We see President Martinez in his ICU room and Christina keeping vigil. Suddenly Martinez starts to have a seizure and the monitors begin to sound alarms, Christina yells for help and the room becomes a hive of activity with Doctors, nurses going to his aid as we fade out. I would understand the use of a disease to take out a large number of the native population. The “Spanish Flu” wiped out millions of people in 1918-1919. Although there is no vaccine against this, it is less threatening these days with modern medicine and what we know in epidemiology. It seems to me, this disease would be more of a threat in underdeveloped countries which lack the medical prowess needed to treat and contain it. I feel they plan to modify this disease to be even more resistant to any known treatments of this day. I missed seeing Simon Lee in this episode. As far as we know he is still detained in that medical house in the community. Perhaps Sophia does not want him dead, but will force him to watch the ‘genocide’ he is so sorely against. 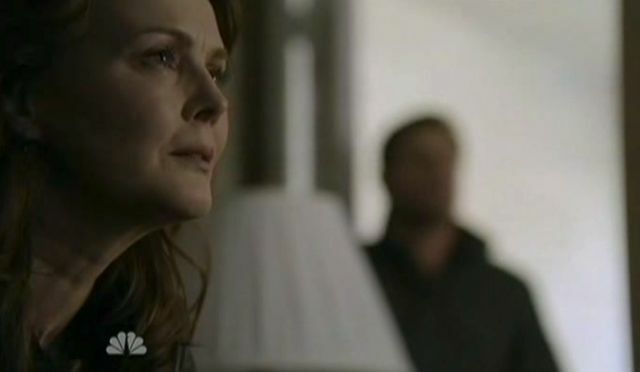 She will punish him for his treason, but I don’t feel she wants to actually take his life. I also can understand Sophia. She is duty bound to save her people from their extinction, yet doesn’t feel a total disregard for the native people here on this world. I do not feel feel she is brought any joy in doing what she feels she must. Perhaps using a disease to winnow the population is in her eyes, a fair thing to do. Those who can survive the sickness will, and they will most likely be allowed to live on in co-existence with the new arrivals from NCG-253. We will have to wait and see! The Event Returns Monday May 2, 2011 with “Us Or Them”! 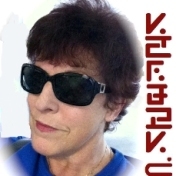 Thanks to Kenn for setting up this dedicated site for all our analysis of The Event and as always we appreciate your visiting our news sites at WormholeRiders News Agency. Please feel free to leave a spam free comment or a question here. I will respond to your comment or question as soon as is possible. Cool review. I love The Event as much as Fringe and V. Thanks. « The Event: Cut Off the Head!